Harman flew me out to New York City to hang out for the weekend so the company could give me a behind-the-scenes look at what it has been working on, all while we enjoyed the historic Formula E in Brooklyn. I spent the weekend with Harman’s top brass and grilled them about the company’s plans for the future. We dug into how Harman Kardon is positioning its brands and its strategic relationships with 34 automotive companies to succeed as the automotive industry undergoes the largest transition in its more than 100-year history. Automobiles are transitioning from 19th century internal combustion engines to electric powertrains. In parallel, autonomous driving technology is progressing to the point where Level 2 autonomous driving systems are moving into production quickly. All major automotive companies are planning to produce fully autonomous vehicles in the next 5 years. These two disruptive injections into the automotive industry promise to topple carefully constructed legacies as new companies arise from the wreckage. Companies that are truly in touch with market signals and emerging trends will pivot and, indeed, are already positioning themselves to capitalize on the transition. They will move aggressively into the new markets to shape the future of the automotive industry. Automobiles will transition from personally owned vehicles to a market of largely fleet vehicles. The personal vehicle ownership experience will evolve into a personalized multimedia experience within the vehicle. This is a transformation from a physical experience to a digital experience that will follow passengers from vehicle to vehicle, from home to work, to the café, and beyond. Autonomous driving will free humans from the task of driving and for the first time in human history, humans will be able to focus on the music, the quality of the sound, a movie in full 7.1 channel surround sound, an immersive 3-dimensional call with coworkers around the world, or any number of other experiences while being moved from place to place. Forward-thinking companies have recognized this opportunity and have started to move into various niches of this future environment. 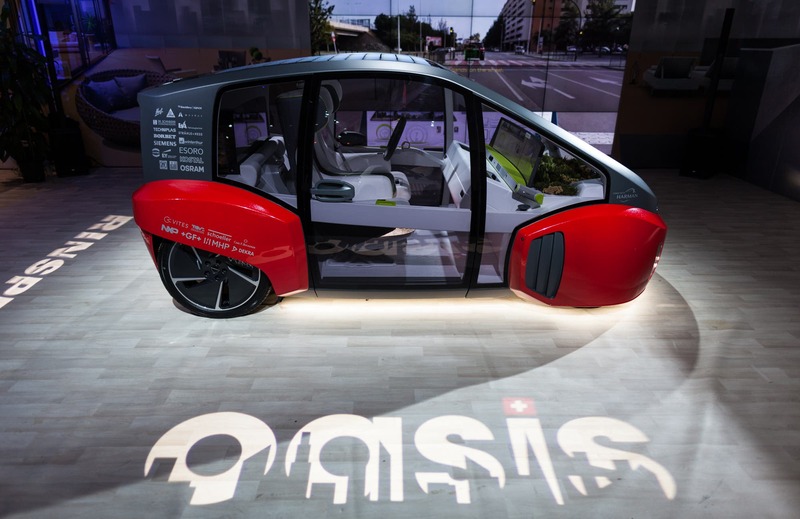 With the average human not fully aware how fast the transition to electric vehicles and autonomous vehicle technology will happen, it is important to step back from the compelling vision of the future automotive experience to build a bridge to that future. Electric vehicles will become the standard for new vehicles over the next 10 years because of cost and cost alone. If we have learned nothing over the course of the climate change awareness movement, it is that most people are not motivated by the environment, as it is too large for our brains to comprehend and not immediate enough of a concern. Making climate-friendly technology like electric cars more affordable than more damaging technologies like internal combustion engines hits budgets, though, and creates a near-term, practically guaranteed, compelling incentive to switch to an electric vehicle. The advantages of autonomous vehicle technology similarly speak to our near-term ambitions. The promise to free us from hours and hours of slavery behind the wheel each week is enticing. Giving back weeks or months worth of time to work more, to play more, or simply to sleep is a gift that the ultra-rich will pay a premium for, at first. As with all software-driven technologies, autonomous driving technology will scale quickly as the initial R&D costs are absorbed and it quickly becomes ubiquitous amongst high-end luxury vehicles. Then it will begin to trickle down into more affordable classes. Economics will be the death knell for human drivers as trucking companies, taxi companies, and delivery drivers are replaced by lower-cost, fully autonomous driving technologies. To the visionaries and early adopters with fingers on the pulse of the automotive industry, these transitions are inevitable and, depending on their individual levels of confidence, will transpire over the next 2 to 10 years. The bridge built by these two technologies to the future of personal transportation specifically wipes the inside of the vehicle clean. It’s a blank slate for visionaries to draw upon as they mold the future that so many have been dreaming of and attempting to recreate in so many science-fiction movies over the last 4 decades. The difference is that now, today, we have the technology to truly build that future and bring it to life for the first time in human history. I think Harman Kardon is one of the visionary companies boldly looking into the future and creating what it envisions to be the future of the human transportation experience. Over the course of two days in New York City, Harman brass laid out their vision for the future, and I have to say, I was impressed. More than that, I’m now even more excited about the future and about the opportunity to be able to share a bit of that vision here. If you were to ask 100 people on the street what products Harman Kardon designs, builds, and sells, you would likely come back with a consensus that it is a consumer products company playing in the audio space. Harman Kardon has for decades designed and built audio products for home, for cars, and everywhere in between that dazzled the ears. The sound system my father owned as I grew up was a Harman Kardon system. It filled my childhood Saturday mornings with the musical creations of Jimmy Page and Robert Plant, with the Grateful Dead and Jeff Beck. I have fond memories of those days and of the music brought to my ears by Harman Kardon and would have given the very same answer as those 100 hypothetical strangers off the street. The truth is that Harman Kardon is very much an audio company but that the expertise Harman Kardon brings to the table is much deeper than just speakers. When an automaker comes to Harman Kardon to buy speakers for its vehicles, it is presented with a full suite of offerings. From unbranded OEM speakers to a 12 speaker Harman Kardon system all the way up to the fully customized, audiophile-quality Revel audio system that was custom tailored and tuned for the Lincoln MKX, Harman truly has products for every use case, at every tier. Aside: I’ll divert here to mention that this is not an advertisement. This is not paid, I don’t have to write any of this … but just as I built the bridge from internal combustion vehicles to the fully autonomous future, it is important to set the stage for the massive attack on your senses that is just around the corner in those very same autonomous vehicles. Harman Kardon parent company Harman’s suite of products goes beyond the sound system into active noise-cancelling technology that is already in use today in ultra-luxury vehicles to cancel out the last remnants of road noise that cannot be overcome by another layer of sound-deadening insulation. Looking forward a few years, that same technology will be used to transform the already quiet interiors of electric (autonomous) vehicles into silence more traditionally associated with movie theaters and audiophile listening rooms like the one buried in the basement of the Harman flagship store in Manhattan. Electric vehicles also bring new challenges to the exterior of the vehicle, where regulators have mandated the production of artificial alerts to inform pedestrians of the approaching vehicle. On the flipside of the equation, some drivers may opt for artificial engine noise to emulate the sounds of a rumbling racing engine to trigger reactions forged over decades of wrenching on internal combustion engines. Record-breaking zero-to-sixty times earned by torquey electric motors will be masked by the artificial sound of a roaring V8 produced by audio companies like Harman. But those technologies are incremental. They show breadth but are not in and of themselves disruptive. Let’s rewind to CES in January of this year. 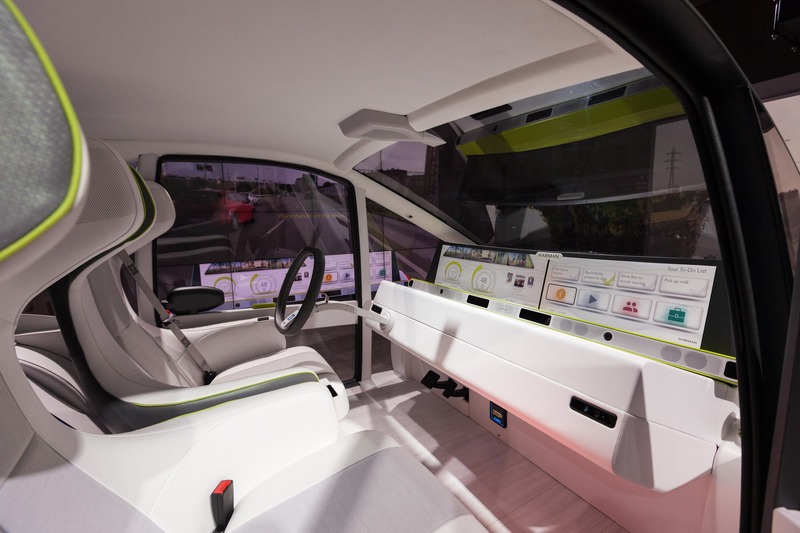 In Las Vegas, Harman unpacked its vision for the fully autonomous (electric) vehicle, which featured an immersive webchat technology that included directional voice tech that synced up the audio with the location of the video of whoever was speaking. Harman tech stretches beyond just enabling more working time (because who really wants to work more anyway?) and enables rich multimedia experiences as well. Harman’s Life-Enhancing Intelligence Vehicle Solution demonstrated a multimedia-rich, immersive, integrated experience that seems a bit too futuristic … until autonomous vehicle technology enters the picture. Then it becomes brilliant. It becomes the vehicle we all wish we had driving us down the road to work, to our relative’s house or just to grab a bite to eat at your favorite restaurant down the street. The awkward part of the rich experiences Harman is slinging is not that they aren’t cool — it is only that we can’t imagine them in our lives today because most people don’t realize how close autonomous (electric) vehicles are to being invaluable pieces of our day-to-day life. 10 years ago, we couldn’t have bothered to worry about having a computer in our pockets. Today, everyone has a smartphone. In my travels in India 5 years ago, I was blown away with how everyone seemed to have a smartphone, regardless of income. Software-based technologies drop in cost quickly as production volumes ramp up. Here at CleanTechnica, we are excited about the future because of what electric vehicles promise to do for global emissions by eliminating tailpipe emissions. We are also increasingly excited about autonomous vehicle technologies because they promise to save lives, while at the same time giving back hours per week or per day. We admittedly don’t often delve into what happens after that in the vehicles and I was thankful to have been invited to attend Formula E in New York City by a company as innovative and forward thinking as Harman to catch a glimpse of what that future might look like … and it’s exciting. Harman paid for travel and accommodations for me to attend the Formula E in New York City. As mentioned above, I was not required to write anything at all about the event or about Harman. These thoughts are all mine, and yes, I am genuinely excited about the future of personal transportation … for more reasons than just the batteries.